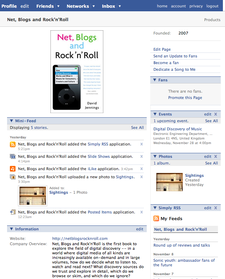 Net, Blogs and Rock'n'Roll: Advice on Facebook Pages? I wanted to put some music on the book profile page. That would be a good example of one of the book's themes. Some Facebook music applications (like last.fm) seem only to be available for personal profiles not for pages. However, iLike said I could add it to my Net, Blogs and Rock'n'Roll page, so I did. 'No songs on this profile,' it said. Fair enough: 'To add, search for music, and click Add to profile.' That's what I did, from the book page. But all the tracks I added ended up not on the book page but on my personal page. I didn't want them there. My new page does not appear to be found in Facebook's search. Search on "Net Blogs Rock", say, and you'll find my personal profile. You won't (at the time of writing) find my new page, which I published a couple of days ago. How come? Along the way, as I've explained, I've added a few applications to the page, and then — on finding that they didn't meet my needs — I removed them. I tried to remove them from the mini-feed using the [x] which says 'click here to remove this item' on mouseover. In Safari and Firefox on Mac OSX Tiger and Leopard, clicking this has no effect at all. Anyone have any solutions to these annoyances? Of course, despite all the complaints, I can't afford to dismiss Facebook. So if you'd like to sign up as a fan on the Net, Blogs and Rock'n'Roll page, I'd be most grateful.